One pan. Twelve ingredients. Thirty minutes. How hard could this be? As it turns out, Happies, it’s not hard at all. This cheat’s coconut curry scored me serious brownie points with the hubby and is great for those nights when you feel like something fancy, but just can’t be bothered slapping away in the kitchen for hours. 1. Place the clove, garlic, coconut milk, ginger and coriander powder, and chilli in a blender and whiz until smooth and well combined. 2. Pour sauce into a deep-based fry pan with chicken breast and bring to a slow boil on a low heat. Pop lid on and simmer for around 15 minutes or until the chicken is cooked through*. 3. Remove chicken from pan and allow to rest, but continue to cook sauce with the lid off, allowing it to reduce. After about 5 minutes, throw in broccoli, fish sauce and fresh coriander. 4. 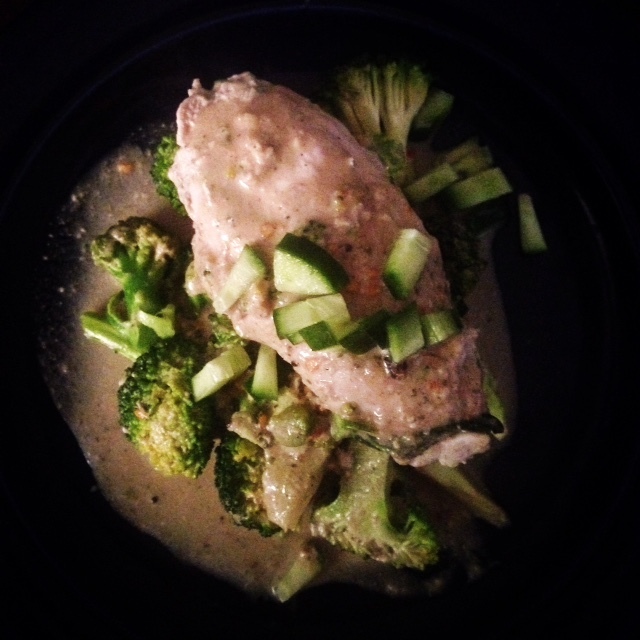 Once cooked, place broccoli on the plate with chicken on top, drizzle with coconut sauce and serve with cucumber, fresh chilli and coriander as a garnish. *I slice a small incision down the fatter side of my chicken breast so it cooks more evenly.